Chad Grey of Hellyeah at Moonstock 2017. Photo by Keith Brake Photography. When something as epic as a national total solar eclipse happens for the first time in thirty eight years, of course you want to be part of it. But what could be better than just watching this phenomenon? How about a four day music festival crescendo-ing with none other than the Prince of Darkness singing “Bark at The Moon” at the moment of totality? That is exactly what happened at Walker’s Bluff located in Carterville, Illinois. Ivan Moody of Five Finger Death Punch at Moonstock 2017. Photo by Keith Brake Photography. Wine country in southern IL is not exactly where one would expect to see a music festival of this magnitude, but it all came together pretty seamlessly. When the first whispers of the possibility of Ozzy Osbourne performing in a quaint Illinois town became audible, most locals thought “Yea, RIGHT!” It seemed like a nice fictitious tale told to garner social media attention only to have the rug pulled out from under us. But Monday, with some in attendance still in disbelief, this wonderful story became a reality. The festival kicked off August 18th and ran thru Monday, August 21 and featured some of today’s biggest, hardest rocking bands on tour. Ozzy would have sold the venue out by himself more than likely but when you add Five Finger Death Punch, Hellyeah, All That Remains, Black Stone Cherry and many, many more it becomes the largest event in southern Illinois so far this year. Lzzy Hale of Halestorm performing at Moonstock 2017. Photo by Keith Brake Photography. Moonstock 2017 featured two stages and more than twenty five local and national acts. The side stage was home to the local acts but that doesn’t mean it was lacking in any way. System Slave, Cause of Ruin, Lori’s Puppets and Skydweller had enthusiastic crowds that kept us all in the mood while the main stage was being switched out. The Main stage had a ton of serious talent. 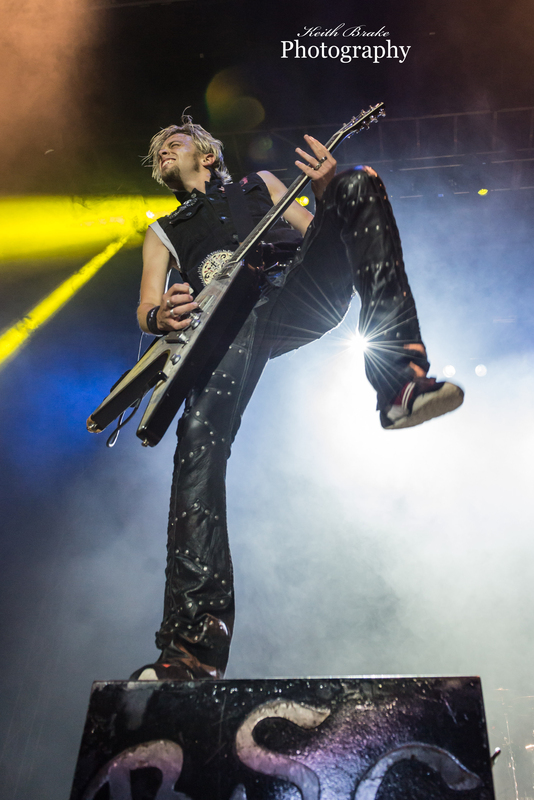 Friday night saw amazingly strong performances from Saliva and Black Stone Cherry. Saliva was impressive with the power and energy that they still have after surviving the test of time and in my opinion had one of the best sets of the festival. Black Stone Cherry took the stage and played a smoking set to close out night one. BSC is in love with their fan base and it shows, these guys truly cater to their fans. Ben Wells of Black Stone Cherry at Moonstock 2017. Photo by Keith Brake Photography. Saturday found Lzzy Hale and Halestorm filling in for Papa Roach. PR had to drop off of the ticket as vocalist Jacoby Shaddix needed unexpected vocal chord surgery. Lzzy and the boys were more than up for the task of closing the first full day of festivities. 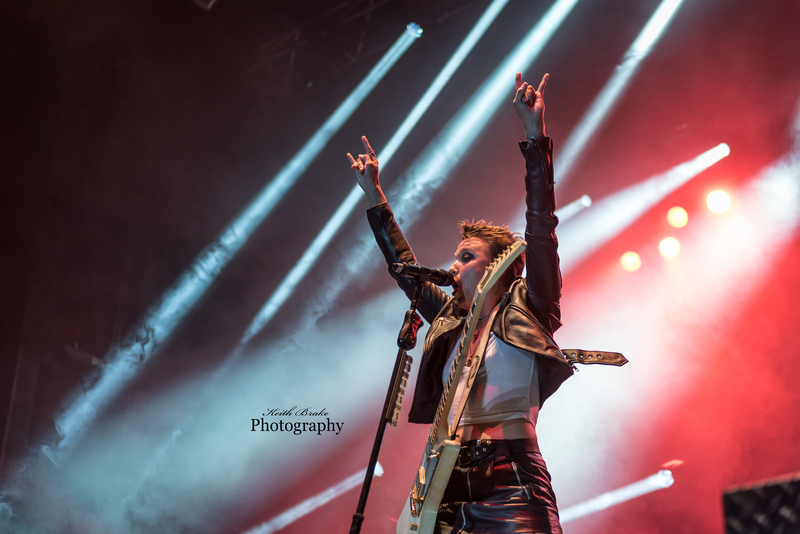 Southern Illinois, like many places, loves a good Halestorm show, and Lzzy gave them exactly what they expected with a rockin’ set that was dedicated to Jacoby and the rest of Papa Roach. Sunday was the Heaviest day on the schedule and it turned out to be a barn burner of an evening. All That Remains, Hellyeah and Five Finger Death Punch all turned in amazingly powerful sets. Hellyeah took the stage as darkness set in on Walker’s Bluff and vocalist Chad Gray immediately punched the entire crowd in the face with a dose of metal awesomeness. The Peoria, IL native and took a moment to commend southern Illinois for being one of the premier locations for metal music and metal fans. Ozzy Osbourne performing at Moonstock 2017. Photo by Keith Brake Photography. When FFDP took the stage the crowd went nuts. The energy these guys have is simply amazing and their powerful presence draws you in like a moth to a flame. 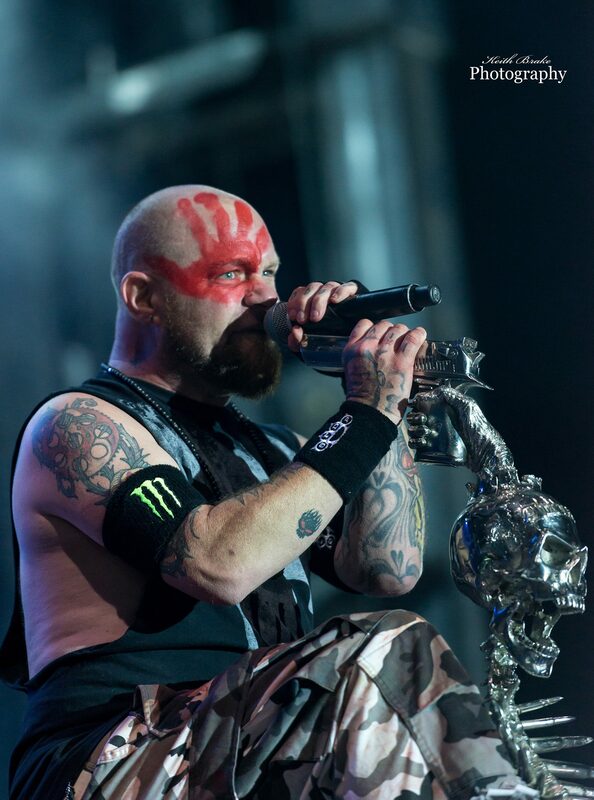 After playing two songs vocalist Ivan Moody beckoned the large lawn crowd to move to the stage. This meant that he wanted the general admission crowd to be in the same area as the VIPS, and what Ivan Wants, Ivan gets. As expected this was upsetting to some in attendance who bought the VIP experience, but none the less, it happened. The energy within the crowd as well as the band skyrocketed at that point and made for an amazing festival experience in preparation for Ozzy’s impending performance. The fourth and final day, the day of the total eclipse and more importantly for most in attendance, The Prince of Darkness. 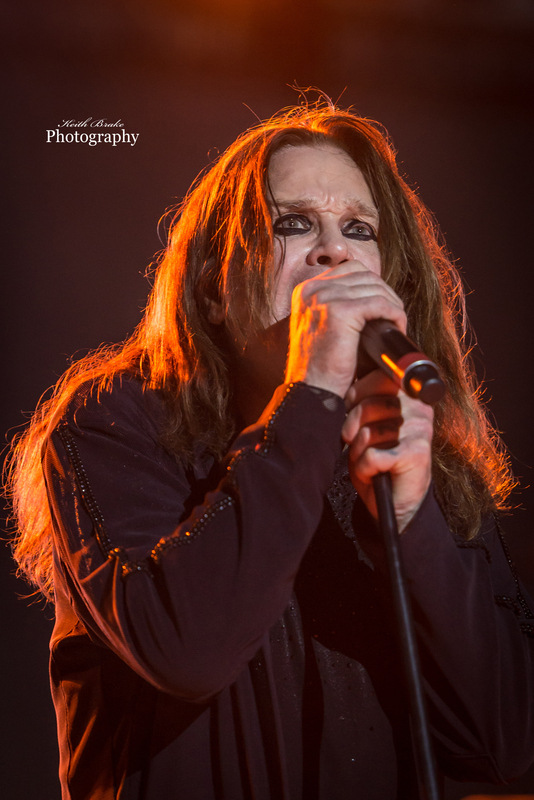 Monday saw the largest crowd of the weekend, no empty seats and twenty thousand amped up Ozzy Osbourne fans. From the moment I walked onto the grounds I could sense today was different from the rest, there was joyfulness and anticipation among almost everyone around. As the moon started to cover the sun, the anticipation grew and so did the energy level. Zakk Wylde with Ozzy Osbourne performing at Moonstock 2017. Photo by Keith Brake Photography. The massive crowd was chanting “OZZY, OZZY” and about four minutes before Ozzy’s set started, they busted down the barricades and rushed forward towards the stage, directly thru the VIP seating. As the security staff tensed with anticipation of the unknown happening, an amazing thing happened. They melded as one very large, diverse family. A family that was ecstatic to see Ozzy. 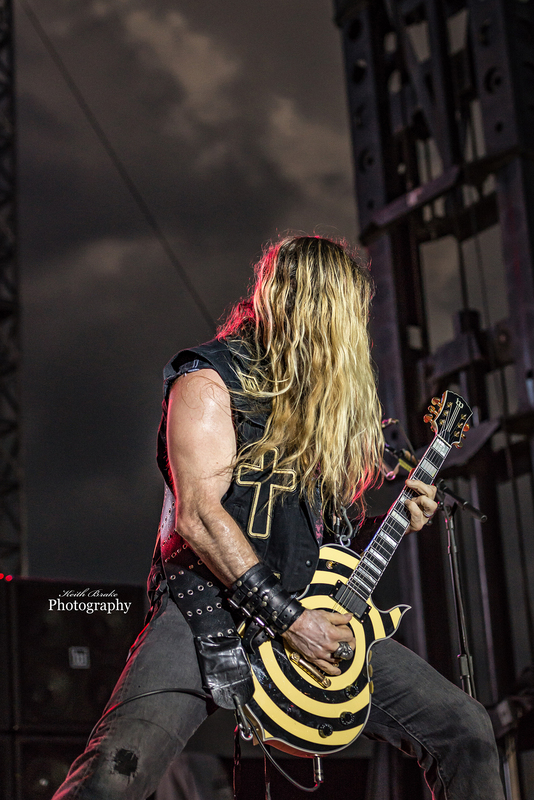 Right on cue, as light turned to darkness, Ozzy took the Moonstock stage accompanied by Mr. Zakk Wylde and delivered a fantastic rendition of “Bark At The Moon”. The performance was both on point and nostalgic, great energy and musical acuity ensured that marriage. As the moment of total eclipse came to pass so did the story that once seemed so unlikely. For all in attendance it was literally a once in a lifetime occurrence, yes there will be other eclipses but they probably will not have the Prince of Darkness Barking at the moon. It is yet to be seen if Walker’s Bluff will host any more music festivals but if they do it’s hard to imagine how they could ever top their maiden voyage. Moonstock 2017. Photo by Keith Brake Photography. Pop Evil performing at Moonstock 2017. Photo by Keith Brake Photography. 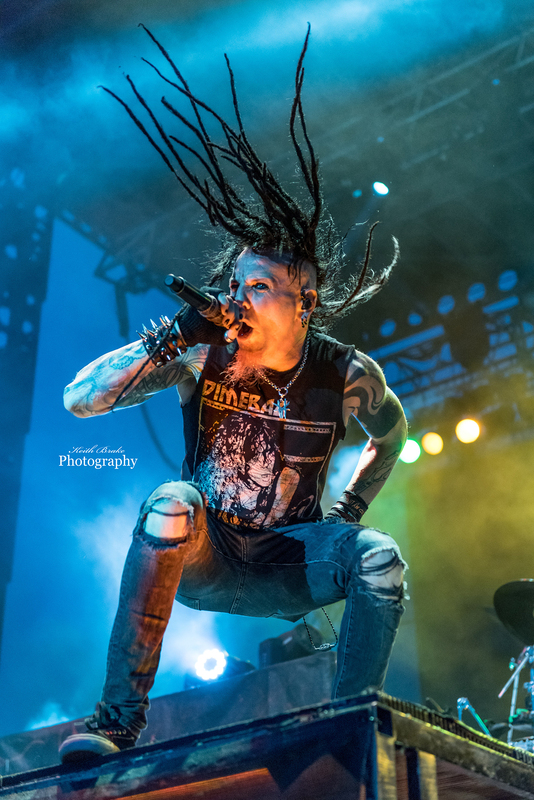 Chris Kael of Five Finger Death Punch at Moonstock 2017. Photo by Keith Brake Photography. Texas Hippie Coalition performing at Moonstock 2017. Photo by Keith Brake Photography. Ivan Moody of Five Finger Death Punch with Phil LaBonte of All That Remains at Moonstock 2017. Photo by Keith Brake Photography. Five Finger Death Punch at Moonstock 2017. Photo by Keith Brake Photography. Otherwise performing at Moonstock 2017. Photo by Keith Brake Photography. Zoltan Bathory of Five Finger Death Punch at Moonstock 2017. Photo by Keith Brake Photography. Saliva performing at Moonstock 2017. Photo by Keith Brake Photography. Black Stone Cherry at Moonstock 2017. Photo by Keith Brake Photography. Phil LaBonte of All That Remains performing at Moonstock 2017. Photo by Keith Brake Photography. Awesome pics! I was there and I had the best time of my life! Moonstock rocked! It was great meeting you August, I’m glad you liked the pics!! Awesome pics and the best review. My sister was there and my friend. Keith Brake painted the picture like no other. Fantastic coverage! !